Hip-Hop Nostalgia: Take It Personal Podcast "Philly Tribute Episode"
Take It Personal Podcast "Philly Tribute Episode"
"Episode 6 is our longest one yet and for good reason. This isn’t your typical Philly hip-hop show, this is the official Philly hip-hop tribute show. Chock-full of Illadelph classics, along with our special tour guides Vinnie Paz, Maylay Sparks, Baby Blak, CHOPS, Todd Wolfe and MarQ Spekt to help navigate you through the two one fifth. Unlike the ewoks, our episode VI won’t disappoint. So whether you’re from Philly, know of Philly or even like Philly, you can’t front on our music. We’re more than just cheese steaks, soft pretzels and Rocky Balboa, we’re home of some of the greatest musicians ever. 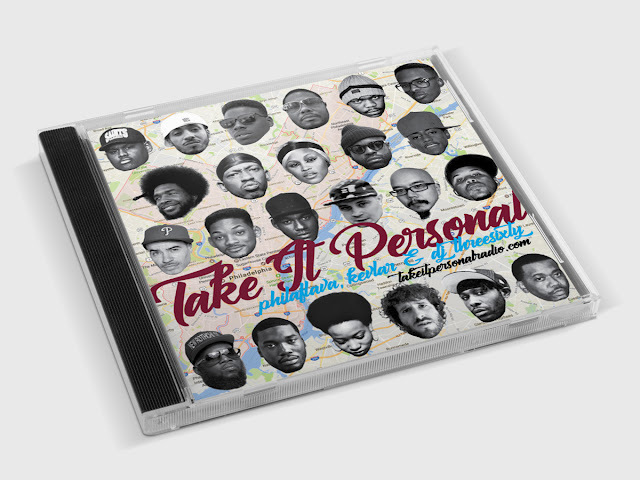 If you’re a fan of Schoolly D, Steady B, 100x, Bahamadia, Freeway, Tuff Crew or The Roots — we got you! – Philaflava." Click HERE for the Philly tribute playlist. The B.U.M.S. "Elevation (Free Your Mind)" 12"
What Would You Like To Change About Hip-Hop? Company Flow 'Info Kill' 12"